Today I'm finishing the last of the 20 blocks for a raffle quilt the Campfire Girls are working on. The list in my mind reads grocery store, don't forget a snack to take with me tomorrow, pack for quilt retreat, clothes to take, will it be warm, don't forget your medicine and much more. 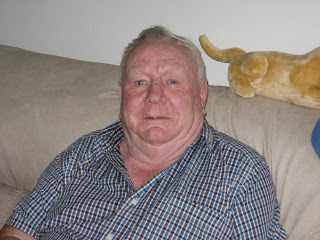 Tomorrow is SweetOldBob's 79th birthday. Now isn't that an Irish mug. I think his paternal grandmother must have been Irish. And tomorrow I'm heading up to Owasco Lake for a quilt retreat at Casowasco. Hope I don't forget anything I need for sewing. The sun is playing hide and seek today. Now to finish pressing those blocks and get down the road to the grocery store. Hope all of you have a great weekend. Grew up on farm in northern Broome County, NY, went hunting and fishing with my Dad. I have two children, three grandchildren. Mom taught me to cook & sew. We always had a big garden.